ALC Construction, llc. 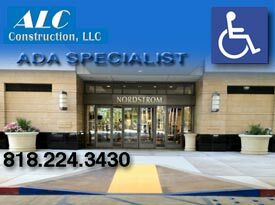 is not only an ADA Compliance Specialist Contractor but also a construction management company. ALC Construction, llc. manages construction projects. ALC Construction, llc. does overall planning, coordination and takes control of a project from beginning to completion. CPM or CM is aimed at meeting a client’s requirements to accomplish a functional and financially sound project. ALC Construction, llc. provides services for all types of commercial, civil, industrial and environmental construction. Once assigned to a construction project that has been completely designed by an architect or engineer, or is still in progress, ALC Construction, llc. wins bids by best value and qualification based selection. This company has the ability to handle public and employee safety. This company also specializes in time, cost and quality management, with an emphasis on decision making, engineering and human resources to accomplish the job for a selected project. ALC is focused on project objectives and plans including characterizing the scope, budget, schedule, and performance requirements. They also have project participants, sub-contractors and suppliers immediately available. ALC maximizes resource efficiency with procedures of labor, materials and equipment. They implement various operations through proper management and control of planning, design, estimating, contracting and construction. All of these are meet regulations and specifications for the entire process by developing efficient communications and mechanisms to resolve conflicts and issues.